Getting ready has always been one of my favorite parts of the wedding day. The anticipation. The anxiety. All kinds of emotions before seeing your partner - the moment when you promise each other the rest of your lives are about to unfold within just an hour or two. Besides, it also allows me to be fully creative in terms of shooting in a photojournalistic way. Often times I don't interrupt with what the bride or whoever is in the room is doing unless I would need to position the subject for a better lighting situation. It's a challenge as a photographer will need to shoot with a vision. Hotel rooms always have a confined space with not much room to walk around, how a photographer is able to see from an unique perspective to document the story is essential to make them stand out from the competition. Every shot you take needs to have a purpose and tell a story. What messages and emotions are you trying to convey? Here in this photograph, nothing was staged. 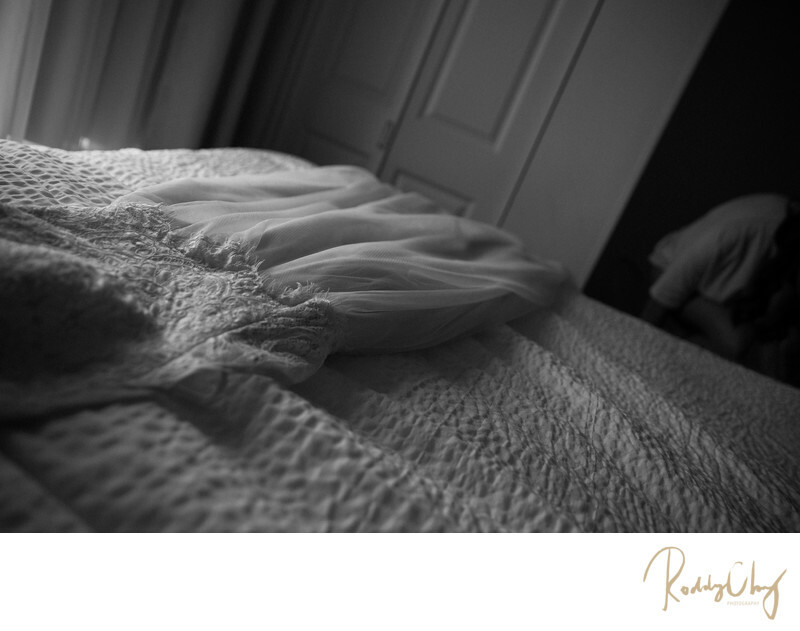 I was able to focus on the wedding dress lying on the bed as the main subject while capturing the bride who's in the background changing to create a narrative. Another important aspect of being a wedding photographer is that you have to make sure everybody, especially the bride, is comfortable being around you. It surprises me sometimes when my bride like Jana would be able to just start changing in front of me without feeling awkward. And I really appreciate it as I feel like I became trustworthy and truly a part of the wedding day. It allows me to truly capture the emotions like this without any restriction! Location: 1800 Yale Ave, Seattle, WA 98101.